SUMMARY: Recent highly destructive thrust-fault earthquakes (e.g., 1994 Mw 6.7 Northridge; 1999 Mw 7.6 Chi-Chi; 2005 Mw 7.5 Kashmir; 2008 Mw 7.9 Wenchuan; 2011 Mw 7.2 Van) have heightened the need to better understand the behavior of such faults and their associated folds on urban centers around the world. The 2008 Wenchuan earthquake, in particular, emphasized that ruptures may link together various thrust faults to generate extremely large-magnitude earthquakes. The geometry and paleoearthquake history of fault systems in southern California suggest that such large, multi-segment thrust fault ruptures are plausible. Perhaps the most obvious of such scenarios could result from simultaneous rupture of multiple thrust faults in the central and western Transverse Ranges, which together form a >200-km-long, interlinked system. While SCEC has invested much in the study of the threat posed by the recurrence of 1857-type, Mw~8 earthquakes generated by the San Andreas fault and its various splays, much remains unknown about these thrust faults and their earthquake potential. Specifically, we need to define the subsurface geometry, slip rates, and paleoearthquake histories of the many fault segments that comprise this system, and use these observations along with dynamic rupture models to assess the likelihood of large, multi-segment earthquakes. We also need to explore the potential hazards associated with such events, including the prospects for strong ground shaking and tsunamis that could have devastating impacts on the coastal population of southern California. SCEC has developed a Special Fault Study Area (SFSA) for the Ventura region to foster research that will help the community to better understand: (1) the structural architecture and earthquake behavior of the Transverse Ranges fault system, particularly the likelihood of large-magnitude, multi-segment ruptures in the Transverse Ranges; and (2) the effects that such large-magnitude events would have on the population and infrastructure of southern California. 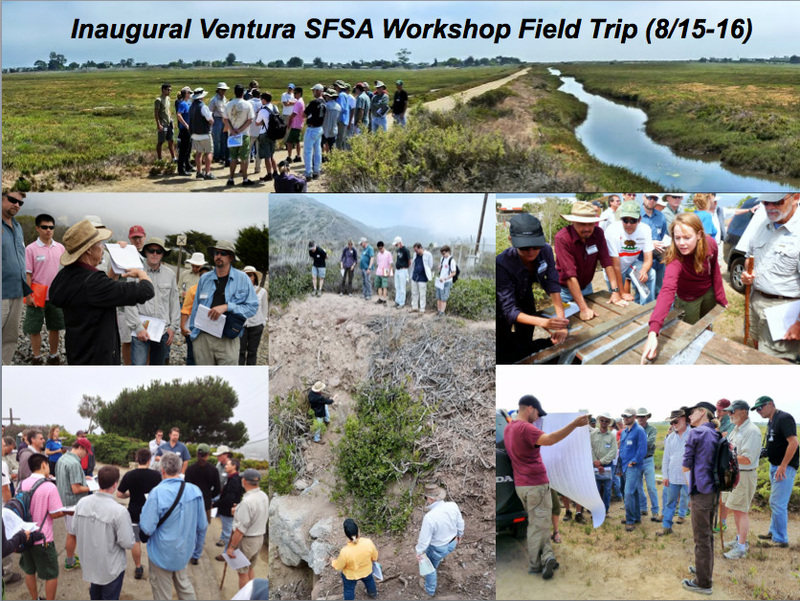 A workshop in Ventura, CA on August 15-16, 2013 brought together interested SCEC researchers to define the research priorities for the Ventura SFSA and foster interdisciplinary collaborations to pursue these goals. The workshop kicked off with an all-day field trip on August 15 where participants explored the major faults and folds in the region, the evidence we have for past earthquake behavior of the system, and the potential impact of large-magnitude earthquakes. Participants were asked to share (in 2 slides, 2 minutes) their research results and/or expertise pertinent to future research in the Ventura SFSA in an evening session. The second half-day session focused on developing a research strategy to better characterize these structures and the seismic hazards that they pose. The results of the workshop will be presented in a white paper to be finalized at the 2013 SCEC Annual Meeting.